Since 2008, Google App Engine has made it easy to build web applications, APIs and mobile backends at Google scale. Our core goal has always been to let developers focus on code, while we handle the rest. Liberated from the need to manage and patch servers, hand-hold rollouts and maintain infrastructure, organizations from startups to Fortune 500 companies have been able to achieve unprecedented time to market, scale and agility on our platform. At Google Cloud Next last week, we delivered on the promise of Google App Engine while evolving the platform toward the openness and flexibility that developers demand. Any language. Any framework. Any library. The App Engine team is thrilled that the App Engine flexible environment is now generally available. General availability means support for Node.js, Ruby, Java 8, Python 2.7 or 3.5, and Go 1.8 on App Engine. All of these runtimes are containerized, and are of course available as open source on GitHub. If we don’t have support for the language you want to use, bring your own. If it runs in a Docker container, you can run it on App Engine. Like Swift? Want to run Perl? Love Elixir? Need to migrate your Parse app? You can do all this and more in App Engine. In addition to the GA supported runtimes, we’re also excited to announce two new beta runtimes today: ASP.NET Core and PHP 7.1. With this release, we also announced beta support for ASP.NET Core on App Engine. This is a great choice for developers building web applications with C# and .NET Core who want to enjoy the benefits of running on App Engine. The Google Cloud .NET client libraries make it easy to use the full breadth of Google Cloud services from your application, and are currently available on NuGet. 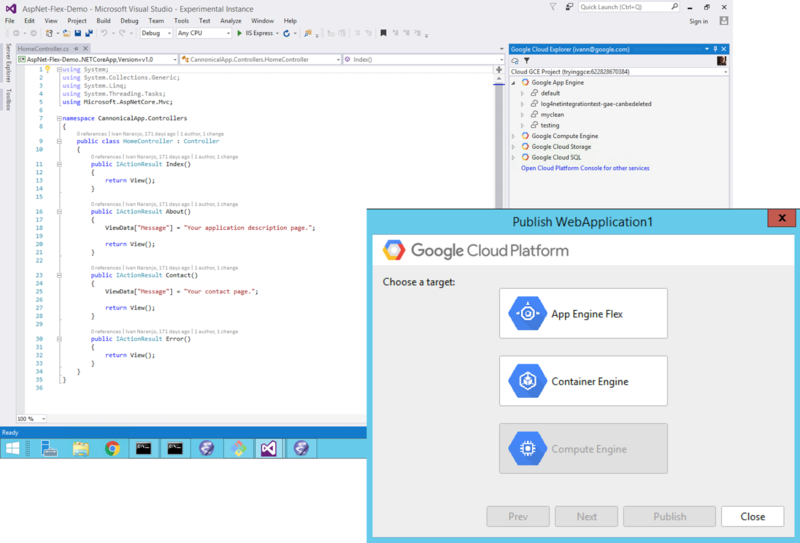 To make developing applications for .NET core on GCP even better, we’ve added support for deploying your apps directly with the Cloud Tools for Visual Studio extension. To get started, check out the App Engine for .NET getting started guide. Along with .NET support, PHP 7.1 support on App Engine is now beta. This runtime allows you to choose between PHP 5.6, 7.0, or 7.1. There are step-by-step guides for running Symfony, Laravel or Drupal and our client libraries make it easy to take advantage of Google Cloud Platform’s advanced APIs and services. To get started, check out the App Engine for PHP getting started guide. At Google, we’re committed to open source and open development. The Docker-based App Engine runtimes, the client libraries, the tooling — all open source, and available on GitHub. The best part about these runtimes and libraries is that they run anywhere that supports a Docker-based environment. The code you write for App Engine works across App Engine, Google Container Engine or Google Compute Engine. You can even grab your Docker image and run it on your own infrastructure. We’re excited to welcome developers of all languages to App Engine. We’d like to extend a warm welcome to Node.js, Ruby and .NET developers, and we’re committed to making further investments to help make you as productive as possible. If you’re an App Engine developer who loves the unique features of the standard environment, we’ve got more coming for you too. Over the next few months, we’ll be rolling out support for Java 8, updated libraries and improved connectivity with other GCP services. Developers that sign up for the alpha release of Java 8 on the App Engine standard environment can get started today. You can expect multiple announcements on both the standard and flexible environments in App Engine in the coming months. We can’t wait to hear what you think. If you’re new to Google Cloud Platform (GCP), make sure to sign up and give it a try. Feel free to reach out to us on Twitter @googlecloud, or request an invite to the Google Cloud Slack community and join the #appengine channel.